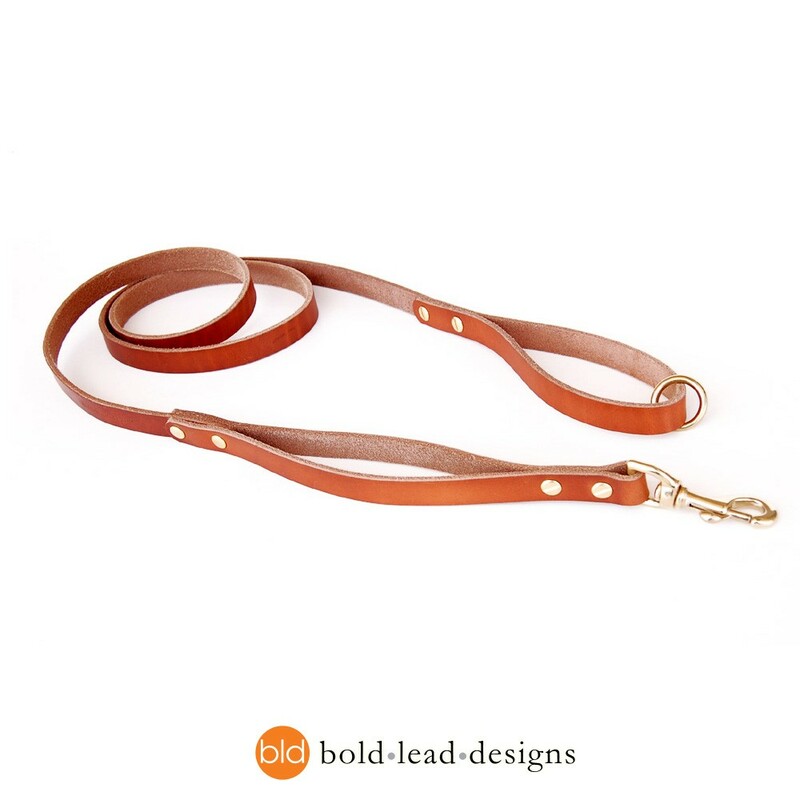 BLD’s Traditional Leather Lead is handcrafted with a solid brass (or chromed brass) bolt snap. A premium quality basic necessity! Most Sizes are in stock and ready to ship! Please allow additional time for items listed as “available on backorder” as these are custom made. More details below, keep scrolling. Please allow 5-7 biz. days for your custom order to be completed. Quite simply the best dog leash you’ve seen at a price that can’t be beat. Made of our soft and extremely durable leather. This is the best quality leash you will find anywhere. There is no stitching to come undone or rivets to wear out. We use only the best and most durable leather that is always soft to the touch and only improves with age. All edges are beveled for a smooth feel. Top quality hardware assures strength and durability. We believe so strongly in the quality of our work, we offer a LIFETIME WARRANTY. Smaller widths are braided on both ends, larger widths are fastened with screw posts for extra durability. Our Golden brown TAN BRIDLE leather is 100% American vegetable tanned leather, made with NO dyes or toxic metallic chemicals. Reminiscent of fine English horse tack, this leather is superior in quality to any other leash you’ve seen. Every leash is HAND-OILED to bring out the softness, so your leash arrives supple and feels great in your hands immediately and only improves with age. The color will darken with use and age to a lovely chestnut brown. Made with premium solid brass bolt snaps and hardware (gold color). Lightweight XS (3/8” / 7mm. width)–for toy and small breed dogs 20 pounds or less. Thinner and more supple option is braided at both ends (not recommended for larger dogs, or dogs that pull). Small (3/8” / 7mm. 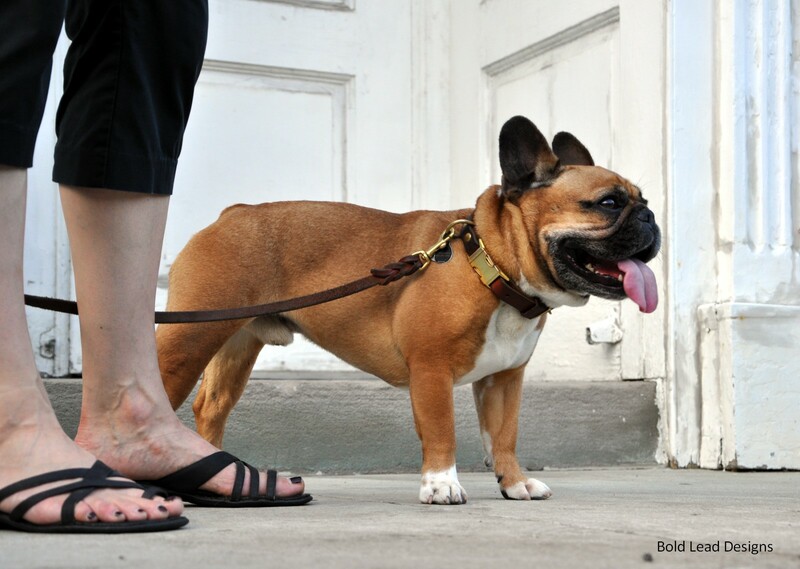 width)—Best for smaller and medium sized dogs. Lighter weight leather is braided at both ends; this narrow width is very secure. Small yet strong hardware. Medium (1/2” / 11mm. width)—*most popular choice! * Great for medium sized dogs, yet sturdy enough for larger dogs. Good for people with petite hands, or who prefer a lighter weight leash. Braided at both ends. Large (5/8” / 14mm. width)—Sized for larger dogs, size fits well in your hands. A good sturdy weight with larger hardware. Screw posts used for durability at the “dog end” of the lead. Extra Large (3/4” / 17mm. width) —Sized for large, giant, and very strong dogs. Great for people who like a big, sturdy leash. Heavy duty hardware. Screw posts used for durability at the “dog end” of the lead. 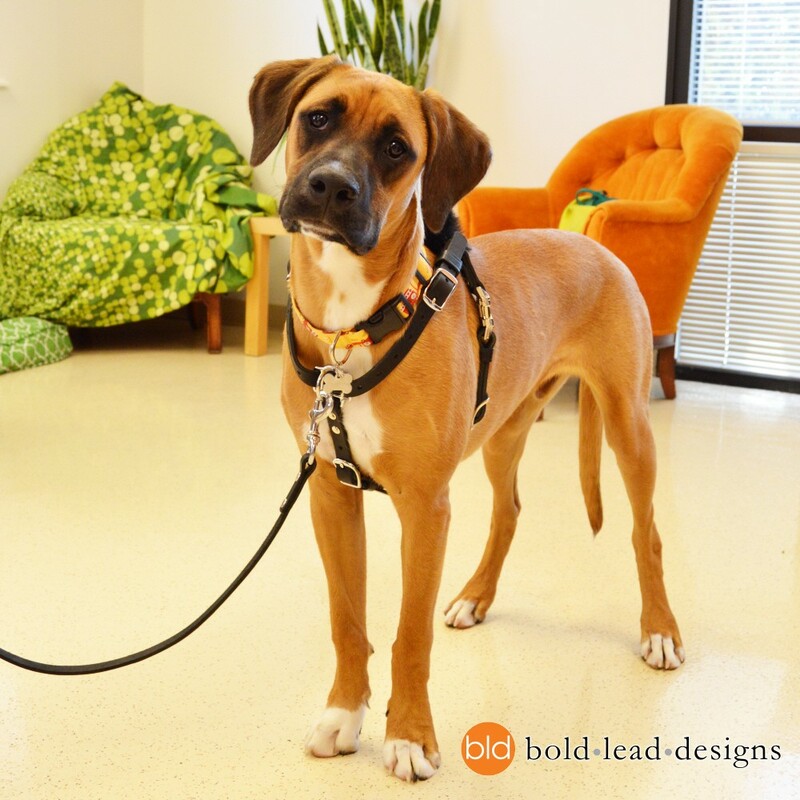 Custom leads are our specialty, but please allow extra time for your leash to be custom made to order. Popular custom requests may be selected when you order. Need more? See other hardware options here, and other modifications here. Looking for a different length? See our shorter Traffic Leads or longer Tracking Leads. Need wider or more heavy duty? See the HD Heavy Duty version here! Swivel Bolt Snaps are the standard hardware. These are the most reliable leash snaps we’ve found. TAN/brown leather comes with solid brass (gold color), BLACK comes with stainless steel (silver color). 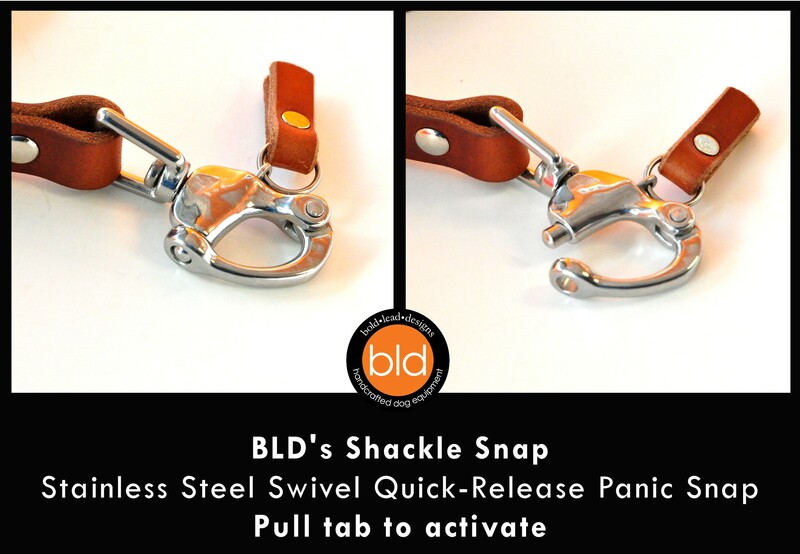 Our exclusive, stainless steel, swivel Shackle Snap (panic/quick-release) hardware is available by request. we have a 43 lb French Brittany who will be 3 years old at the end of the year. 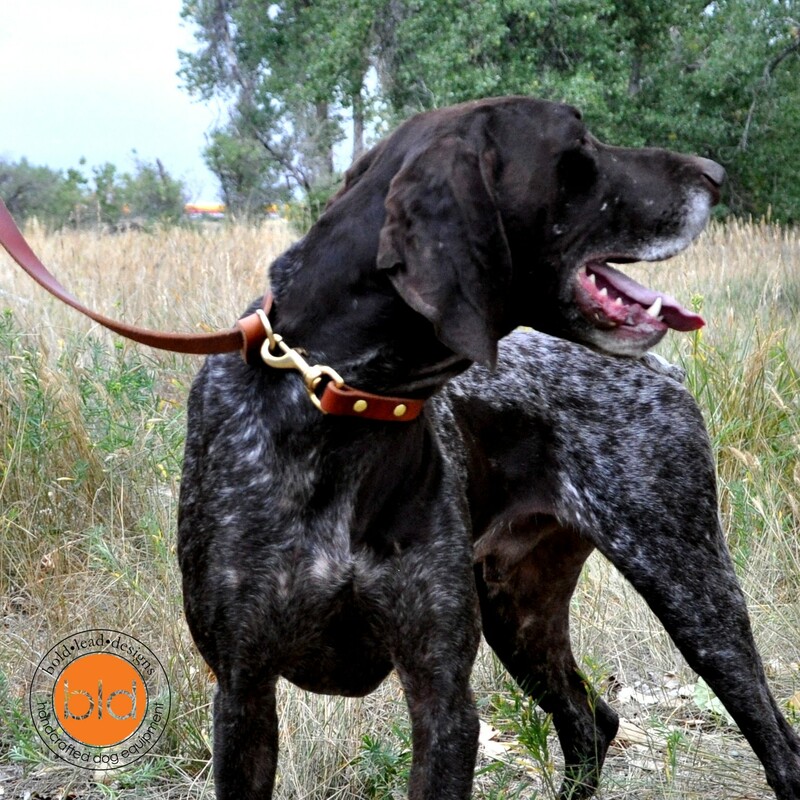 He likes to pull on his leash whenever there is quail or rabbits around…. We are using the 6 ft leash for several months and this is our first leather leash. I am happy to say there is no more leash burn….. The leash is also sturdy, and looks like new despite heavy use (and abuse ;). The light brown color beautifully matches my dog’s fur color and we are getting lots of compliments. My new favorite training leash! I have the tan & brass, 3/8th wide six foot leash for my 22lb Corgi. Lightweight but very durable and has a great feel. Breaking in beautifully. I had them add a floating o-ring to the handle so I can clip it around my waist when she is off-leash, or inconspicuously attach a long line to the leash when practicing long-distance stays. The snap is also the perfect balance of possessing strength without being heavy or bulky. After a nylon leash I had been using for a few years failed (the snap fell apart) while I was walking one of my greyhounds last weekend, I decided it was time to replace a couple of older leashes with something better. I had a couple of requirements: leather and made in the USA. After looking at a number of websites, I found BLD. I liked the look of their products and the sound of their organization, so I ordered a couple of the traditional 4-foot leashes, size medium. I called the company the next day to ask a couple of questions and spoke with a young lady who was pleasant, professional and efficient. The leashes arrived two days later (Colorado to South Carolina in two days, very nice!). Beautiful leather, rock solid hardware and obvious craftsmanship. Combine theses facts with the lifetime guarantee, I know I chose wisely. They are perfect! I certainly plan to make future purchases from BLD and am already recommending them to my friends. I love this leash! I purchased the 1/2″ and when it arrived I thought it looked too thin because I’ve gotten used to using wider leashes. But after just the first use I fell in love with it. It’s perfect! It looks beautiful, it’s soft, smooth, and feels great in my hands. 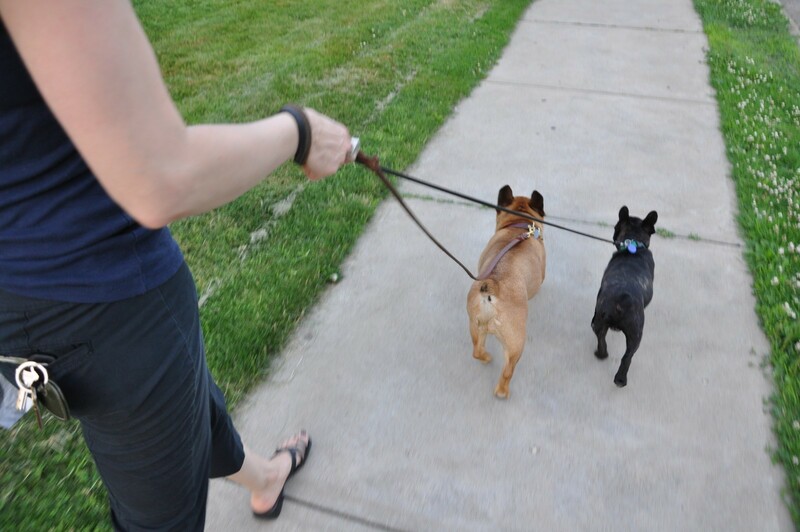 I have small hands but my husband does not and this leash works great for either of us. Purchased Black Latigo 5 ft meadium lead for my English Cream Golden Retriever. This lead is so soft i t is exactly what I was looking for. Quick shipping. Plan on ordering another 6 ft lead. Thank you for making a quality product at an affordable price. I ordered a 6 foot lead for everyday use with my GSD. I love the construction, soft feel in my hands and the durability of this beautiful leather leash. Everyone should have a leash like this. I loved this leash so much I ordered a spare! These are high quality leather that get softer and better with age while maintaining durability. The leather has stood up very well to the crazy Chicago weather with very little care. 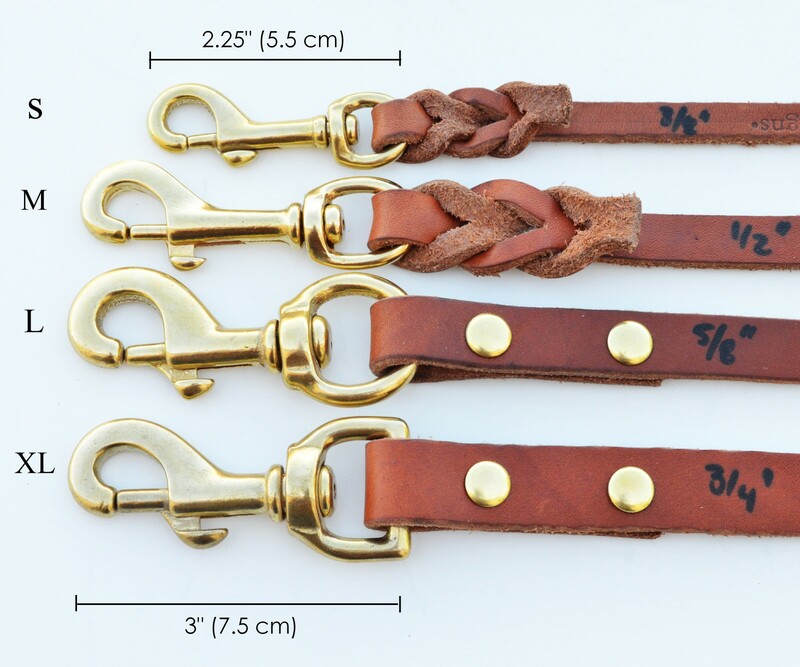 I love these leashes and would highly recommend them. My Jack Russell Terrier busted out of a leash bc the bolt snap just popped open & stayed that way, also the leather was about to break. (It was only about 4 yrs. old) I searched & got a scissor clasped one that only came in a size that was too heavy for him & a leash that was thick for my hands. I felt terrible that it was such a heavy clasp but opted for safety. Then, a friend told me about Bold Lead Designs. There were so many choices! I read that the bolt snaps were the most reliable, more than the scissor snap I had gotten “to be safe.” No throughly confused, I decided to call to consult w/someone. Katrina was amazing–went over all the pros & cons of all the choices. 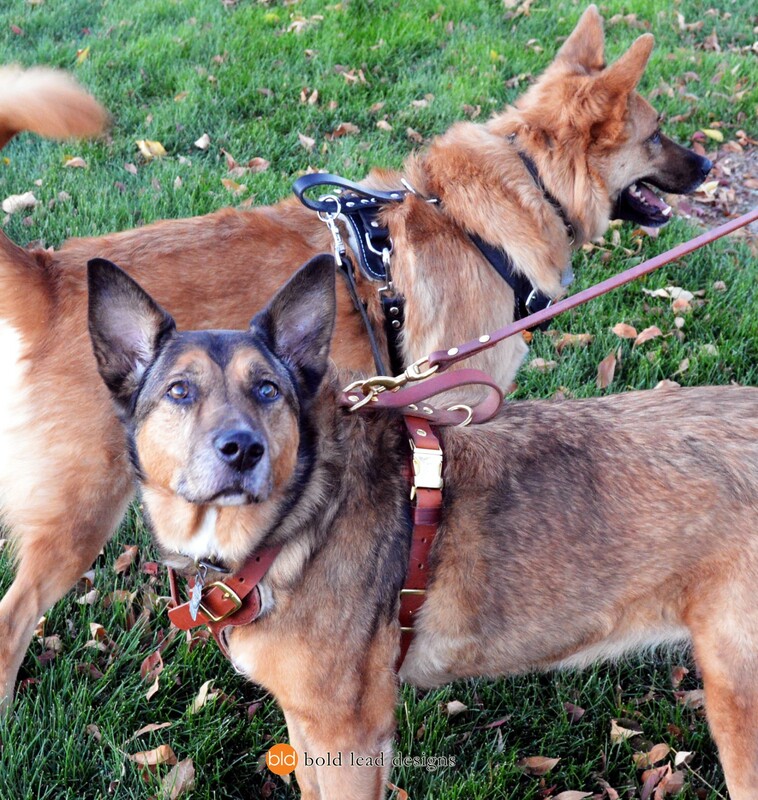 I ended up w/the the traditional leash w/bolt snap and the leash is great! My dog doesn’t have a huge clasp weighing him down and the 1/2″ leash is better in my hand—after just a week I can feel the leather softening! The bolt snap seems secure, the craftsmanship is beautiful, and the customer service is great. I feel this will last a lifetime; but if I end up needing another leash or accessory I will most definitely get it f/Bold Lead Designs! I bought the bridle leather 6′ and liked it so much I bought the 4′ in latigo leather. I have a 146.6lb 15 month old Newfoundland so wanted a strong leash, easy on the hands. (I am 75). I could not be more pleased with both leashes. Highly recommend BLD! 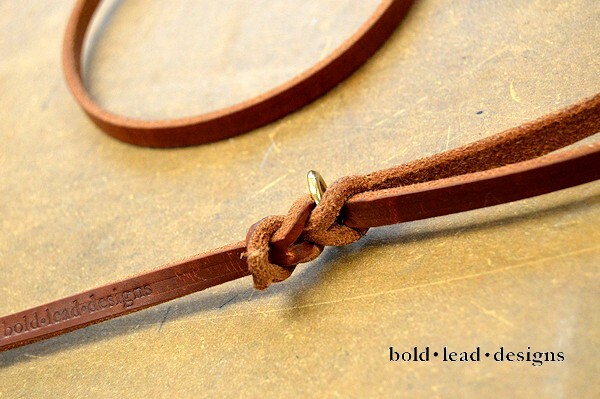 Another great product from Bold Lead Designs! High quality and very durable great for everyday use. 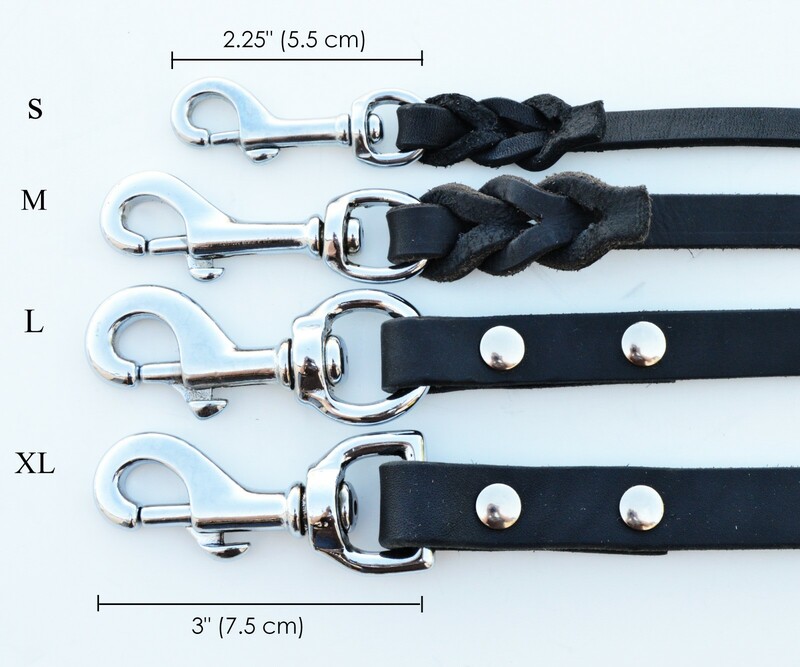 I bought this product a couple months ago and it has worn in very nice, one of the best leather leashes I have bought! i bought the 5-foot 5/8″ tan lead more than 1.5 years ago. When I first received it I was impressed with the quality of the leather and craftsmanship. I’ve never seen such a nice leash for the prices offered by BLD. The leash is still holding up fantasticly. It’s now much darker and has become very pliable with use. I have no doubt it will last a lifetime if properly taken care of. I plan on buying several more this Christmas to share with my dog loving friends! 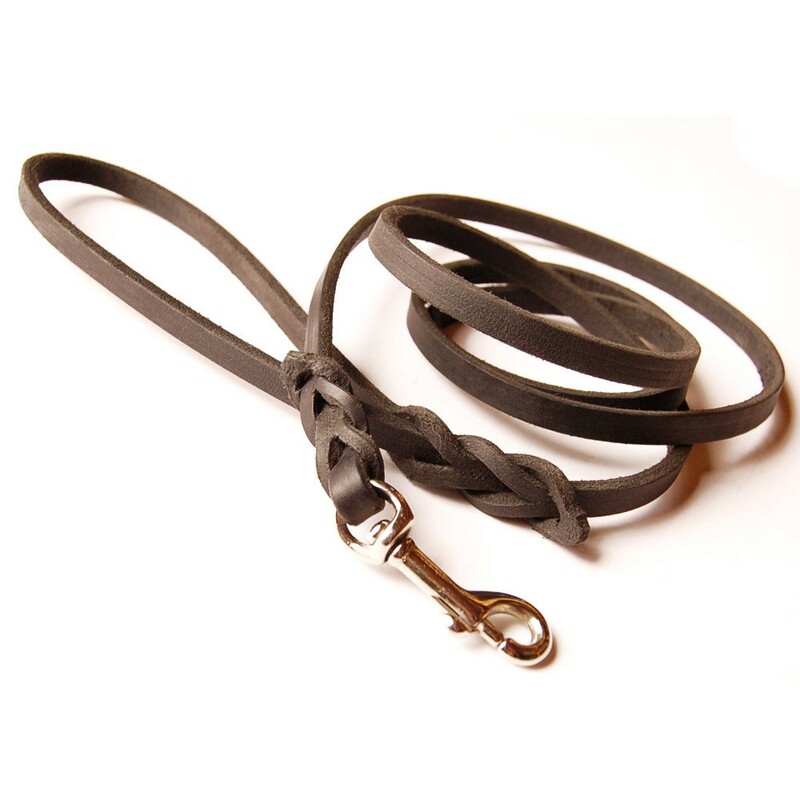 Absolutely love the medium 6ft leather leash with the perfect pace leather halter. Excellent quality leather and craftsmanship. I would have gone with a large or extra large for our Bernese Mountain dog if I were using it with a regular collar. Since she does not pull with the perfect pace, the medium is light and more than strong enough to use with her. Love my leash! Soft quality leather and Bold Lead was very helpful in making the customizations I wanted. 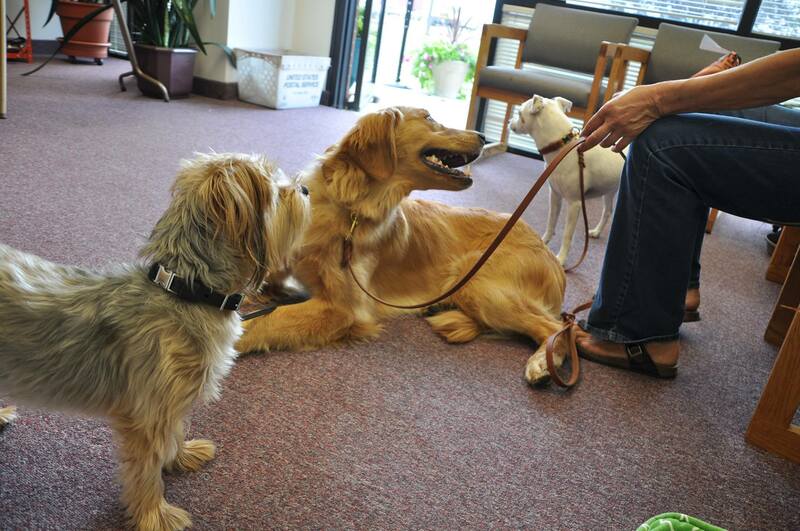 As a dog trainer, I have lots of leashes. But I didn’t have the perfect “everyday” leash for my Chesapeake Bay Retriever. Well, I finally found it. I was able to order the length I wanted and the bells and whistles (loose ring on the handle, fixed ring on the leash) that made it completely functional. The leather and workmanship are impeccable and all for a super reasonable price! Will definitely recommend to my students. I special ordered the 1/2″ 6 foot lead with a stainless steel snap and I LOVE IT! I have a great dane and we do obedience training/competition and I wanted a high quality, black, braided end lead and BLD had just what I was looking for. The customer service was great…I must have called 3 times to ask questions about snap options and the best width leather to use for my petite hands and I totally got steered in the right direction and am extremely happy with my purchase. I also bought a matching training tab and the set gets quite a but of attention at class. Stunning workmanship! This is beautiful soft flexible leather. I got the dark finish and it is gorgeous. No break in. It all it’s soft right out of the package. . . I highly recommend this – this is beautiful work – beautiful craftsmanship. Great leash for everyday use. Looks great on my dog and is nice to hang on to. I have a 3 foot and a 6 foot, 1/2 inch for competition. It’s narrow enough to wrap many times into one hand, but strong enough to feel confident when walking about the trial grounds. It’s simple yet beautiful. 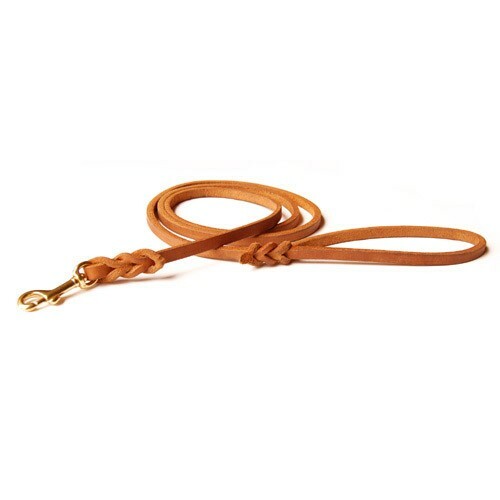 I’ve seen my peers’ leather leashes and many of them are losing the stitching but it won’t happen to a braided leash. This leash is also buttery soft and becomes unbelievably more so as it ages. Just make sure you follow BLDs care instructions and that you actually use the leash. It’s so soft, so strong and a classic design that goes with any fancy or plain collar or harness. Spoke about this leash to a friend and then got one as a gift. I have a husky and they are known to be pretty direct when walking. This leash allows both the freedom that she wants and the control that I need. An excellent product, very well made. I’ll be making future purchases. This was my first leather lead ever, after over 40 years with dogs, and I will never go back! I purchased this in 1/2″ in tan not long after I brought my Bearded Collie puppy home a couple of years ago, on a friend’s recommendation. I have 3 dogs and one or the other has it on every day, now that the Beardie has mostly taken possession of the 8-way! I love the braiding and how easy it is on my hands. The more it “ages” the better it feels and the prettier it becomes. I have occasionally used the Bick’s conditioner on it, or a bit of Neatsfoot Oil as recommended by BLD, but it has really needed very little care. Just received a 6 foot lead. It truly is a thing of beauty. Thank you for your craftsmanship it is very much valued. I just wanted to let you know that I love your leads and collars. I had been searching for the perfect lead/collar combination for my Bernese pups. I had ordered from other places, and the product wasn’t quite right (cheap-feeling hardware, uneven leather width, unfinished edges, etc.). Your leashes and collars are perfect. Outstanding-quality hardware (love the screw-in rivets), thoughtful design (like the double d-ring on the collar), and substantial feel. I’ll be back for the tan leather versions soon. Lovely quality lead, and the golden tan color is gorgeous and eye catching. I got this delivered at 4pm and it was in use at obedience class by 6pm that night. Leather is soft and smooth and very supple. I’ve gotten leads from other sources that oil the heck out of poor quality leather and try to pass it off as soft leather. No worries like that with the Bold Leads! They are awesome at first touch, no break in needed. I received the leashes that I ordered & just want to say WOW! Thank you so much. They are beautiful & well made. The leather is not only substantial but supple. I ordered 2 standard 6ft black leads, a brown traffic lead, & a black 8-way lead. The standards will of course be for everyday walks. The traffic is for my very large Anatolian who I like to keep close when I take her into social situations, & the 8-way will be used when I go on transports for various rescue groups. I feel certain that they will be well used & long lived! 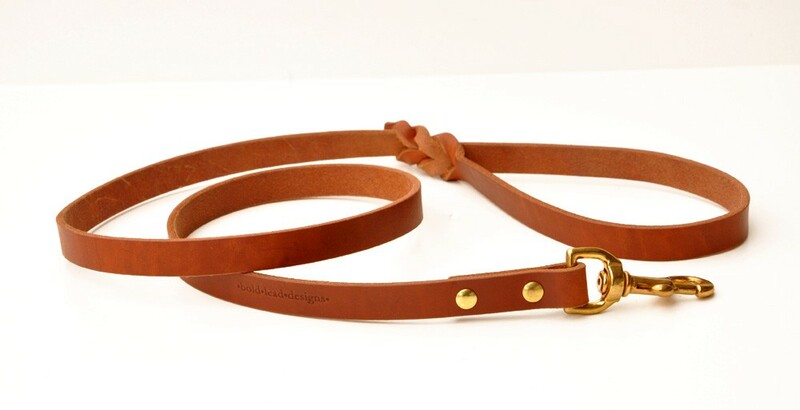 I have been searching for a quality leather leash for some time and I have finally found it in this one. The quality and craftsmanship are top notch and I couldn’t be any more happy with my purchase. This was definitely money well spent. I like a light leash for training and walks so I opted for the medium size, it’s every bit of strong to satisfy my 60 pound bulldog. Katrina’s customer service and attentiveness to my order was top notch and I received my package in no time. Great company, great product, don’t hesitate, buy now! 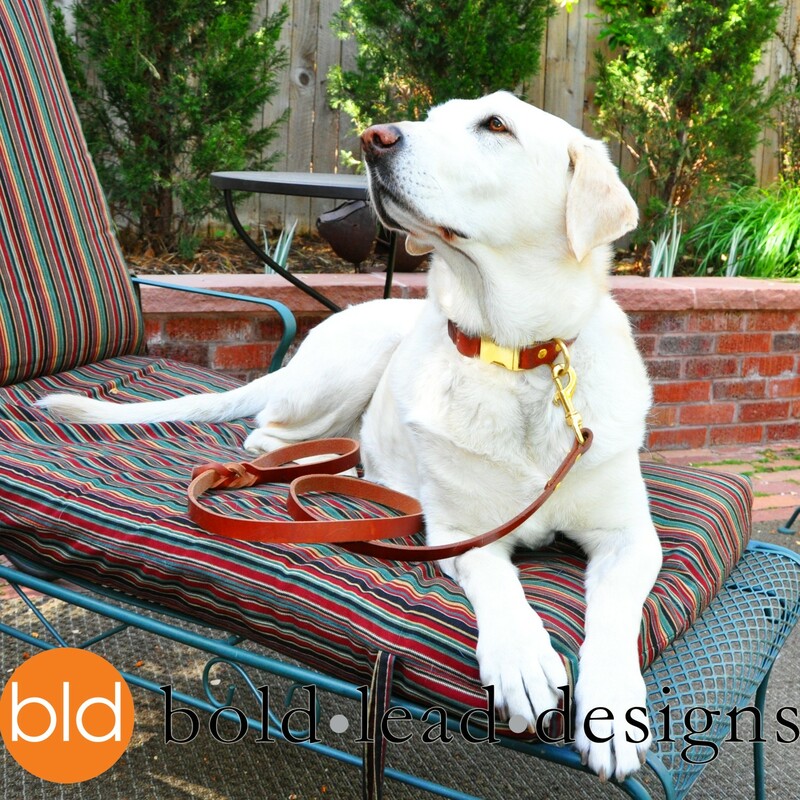 I purchased a BLD leash (mine is the medium or small, I believe) in black Latigo leather at a local boutique. I LOVE it. Years of equestrian sports have left me almost unbearably picky about leather gear. This is first lead I’ve handled in a LONG time that wowed me with the quality. It’s thick and sturdy and yet so, so soft. It conditions up beautifully and holds up in the weather (so far). The craftsman ship and detail on the braided/twisted portions is just stunning. I haven’t been so in love with a leash in long time. The price on this stuff is excellent too. Think about it… $25 for a crappy, poorly made leather leash at a box store, or $33 for a beautiful lead that will last you a lifetime? The math is easy. 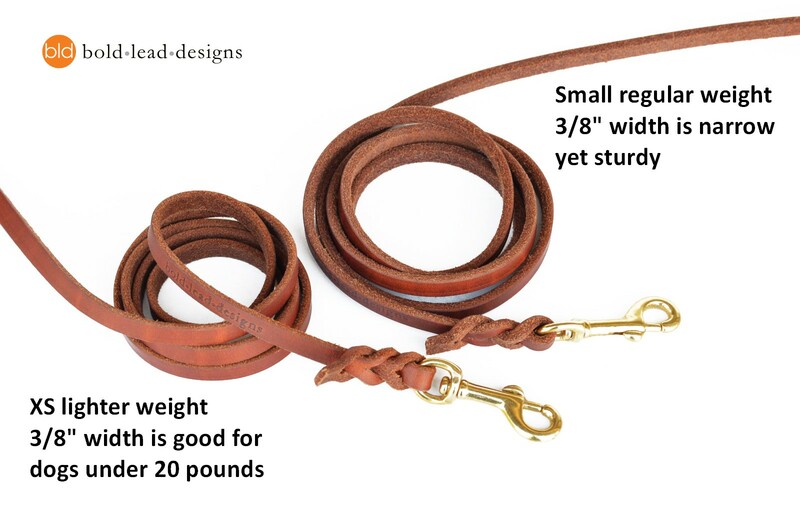 Coming from the horse industry I have a strong desire to own quality leather gear that has the right feel and durability to it along with looking great , I search for a few weeks before I stumbled upon Bold Lead Design and I couldnt be happier with the leashes I have received from this company , as great as they look in the photos they are even better in person. Love this leash – I use it every day for my Springer Spaniel. The leather quality and craftsmanship are excellent (and I should know – I used to work for a custom saddler!) I recommend this product as a great basic leash for my dog obedience students – durable, high quality, easy to care for, and comfortable to hold. 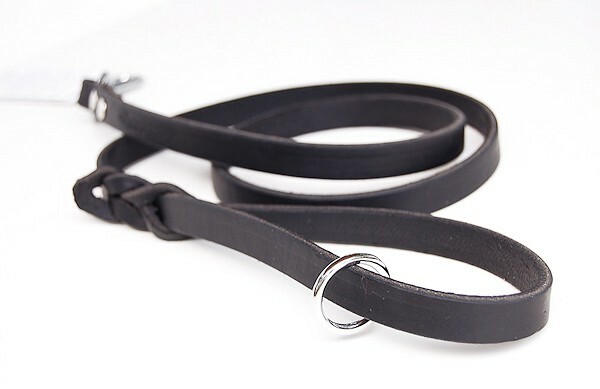 I looked for a good leather leash for a while and was so excited when I found and received this one. The leather is excellent; finally a high-quality leather that is a beautiful color, comfortable, durable (and won’t stain my dogs’ necks orange in a light rain, like that cheap stuff!) It’s been the best simple but beautiful leash I’ve found anywhere.